Credit: Image credit Erich Fisher. Imagine a year in Africa that summer never arrives. The sky takes on a gray hue during the day and glows red at night. Flowers do not bloom. Trees die in the winter. Large mammals like antelope become thin, starve and provide little fat to the predators (carnivores and human hunters) that depend on them. Then, this same disheartening cycle repeats itself, year after year. This is a picture of life on earth after the eruption of the super-volcano, Mount Toba in Indonesia, about 74,000 years ago. In a paper published this week in Nature, scientists show that early modern humans on the coast of South Africa thrived through this event. "It was one shard particle out of millions of other mineral particles that I was investigating. But it was there, and it couldn't be anything else," says Karkanas. "Takis and I had discussed the potential of finding the Toba shards in the sediments of our archaeological site, and with his eagle eye, he found one," explains Curtis W. Marean, project director of the Pinnacle Point excavations. Marean is the associate director of the Institute of Human Origins at Arizona State University and honorary professor at the Centre for Coastal Palaeoscience at Nelson Mandela University, South Africa. "The Pinnacle Point study brought me back to the study of glass shards from my master's thesis 40 years earlier," says Smith. "Many previous studies have tried to test the hypothesis that Toba devastated human populations," Marean notes. "But they have failed because they have been unable to present definitive evidence linking a human occupation to the exact moment of the event." The Pinnacle Point team has been at the forefront of development and application of highly advanced archaeological techniques. They measure everything on site to millimetric accuracy with a "total station," a laser-measurement device integrated to handheld computers for precise and error-free recording. Cleghorn explains, "We collected a long column of samples – digging out a small amount of sediment from the wall of our previous excavation. Each time we collected a sample, we shot its position with the total station." "These models tell us a lot about how people lived at the site and how their activities changed through time," say Erich Fisher, associate research scientist with the Institute of Human Origins, who built the detailed photorealistic 3D models from the data. "What we found was that during and after the time of the Toba eruption people lived at the site continuously, and there was no evidence that it impacted their daily lives." "We found the shards at two sites," explains Marean. 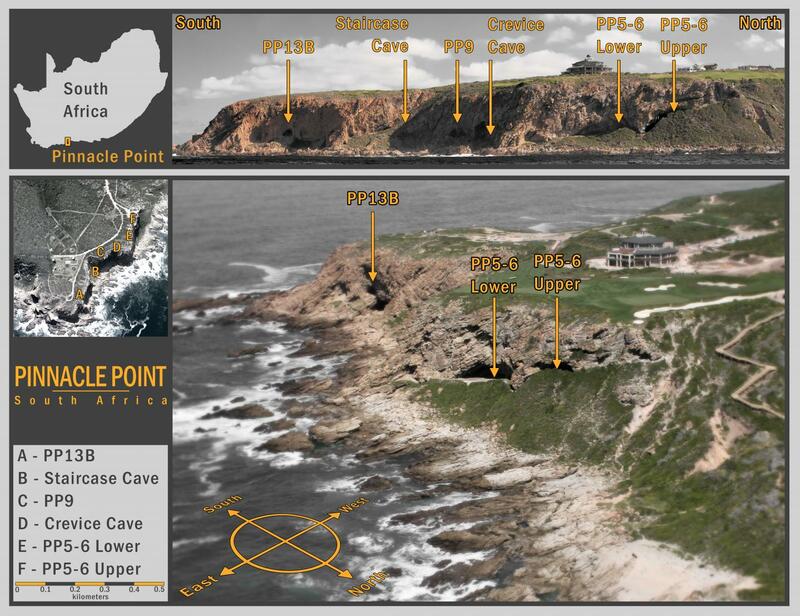 "The Pinnacle Point rockshelter (where people lived, ate, worked and slept) and an open air site about 10 kilometers away called Vleesbaai. This latter site is where a group of people, possibly members of the same group as those at Pinnacle Point, sat in a small circle and made stone tools. Finding the shards at both sites allows us to link these two records at almost the same moment in time." "There has been some debate over the accuracy of OSL dating, but Jacobs' age model dated the layers where we found the Toba shards to about 74,000 years ago – right on the money," says Marean. This lends very strong support to Jacobs' cutting-edge approach to OSL dating, which she has applied to sites across southern Africa and the world. "OSL dating is the workhorse method for construction of timelines for a large part of our own history. Testing whether the clock ticks at the correct rate is important. So getting this degree of confirmation is pleasing," says Jacobs. Publication: Eugene Smith, Zenobia Jacobs, Racheal Johnsen, Minghua Ren, Erich C. Fisher, Simen Oestmo, Jayne Wilkins, Jacob A. Harris, Panagiotis Karkanas, Shelby Fitch, Amber Ciravolo, Deborah Keenan, Naomi Cleghorn, Christine S. Lane, Thalassa Matthews, and Curtis W. Marean (2018). Humans thrived in South Africa through the Toba super-volcanic eruptions ~74,000 years ago. Nature DOI:10.1038/nature25967.